During our second year of operation, June 1, 2017 to May 31, 2018, the Southern California Nutrition Incentive Program, also known as the ¡Más Fresco! More Fresh Program, enrolled 1,230 CalFresh recipients living in Los Angeles, Orange and San Diego Counties. CalFresh recipients who enroll in this program have the opportunity to earn up to $40 per month for a year when they purchase fresh fruits and vegetables at participating Northgate Gonzalez Markets. During this time frame, the ¡Más Fresco! More Fresh Program conducted 30 ¡Más Fresco! 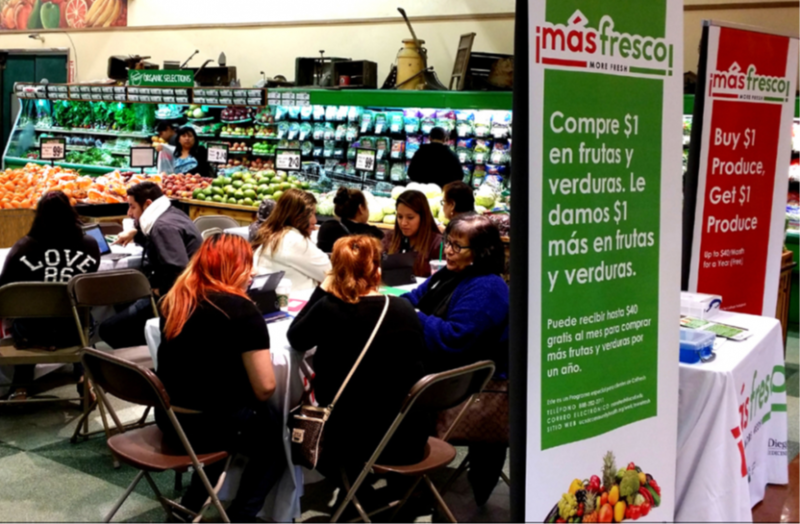 More Fresh Program Enrollment Events at six Northgate Gonzalez Markets in Los Angeles, Orange and San Diego Counties (2 markets per county) with the valuable assistance from Community Health Workers (Promotores) from Latino Health Access and Vision y Compromiso. Data collection on our first cohort concludes on June 30, 2018. We are hoping to share evaluation results from our first group of 1,153 ¡Más Fresco! More Fresh Program participants by the end of Summer 2018.